“The important thing is not what they think of me, but what I think of them…"
The worlds of Steampunk and Victorian Science Fiction are a fantastic setting to game within. Yet nothing seems to epitomise the Victorian era more than the Queen-Empress who gave her name to it – so what could be better than a figure that brings the fantastical and the historical into a glorious union? Steampunk Victoria is the product of a fevered imagination and a desire to hit as many of the ‘targets’ of the genre as we can. Clockwork Monocular? Check! Steam Powered backpack? Check! Large calibre firearm? Check! 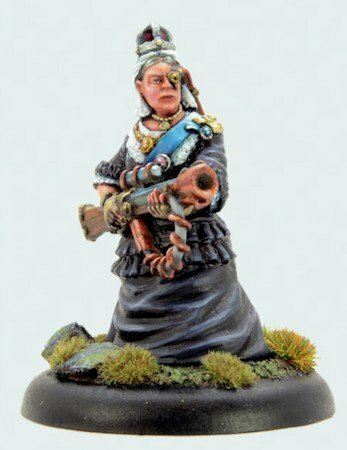 Now you can field the Queen-Empress in your tabletop battles, striding forward at the head of Her Majesty’s Expeditionary Force On Mars or prowling the backstreets of London on secret missions to defeat the enemies of her Empire. One miniatures per set, 28mm sized metal figure supplied unpainted. Plastic base not included. Every set comes in a limited edition numbered gift box. Only 500 will be made.